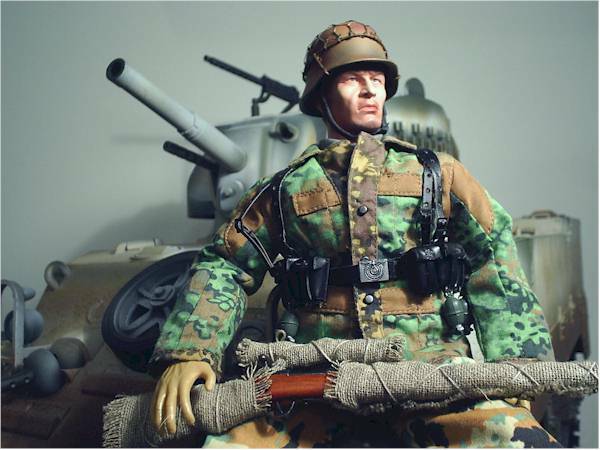 Galactiboy, collector of all things sixth scale, is back tonight with a nifty WWII review - take it away, GB! Hello again, tonight I’ll be reviewing a figure from Dragon in Dream’s (DiD) World War II Series. You may remember DiD from their abysmal Lord of the Rings figures from a few years back? Well, you wouldn’t recognize them as the same company nowadays. I have to admit I really didn’t know too much about DiD when I stumbled across this line while perusing eBay, but after seeing the detail and quality of the figures I decided to take a risk and pick one up. 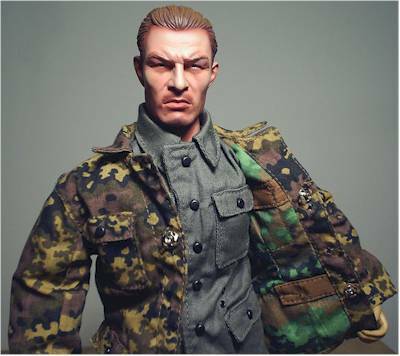 I was particularly interested in the look of the Helmut Thorvald figure and that’s who I ended up with. 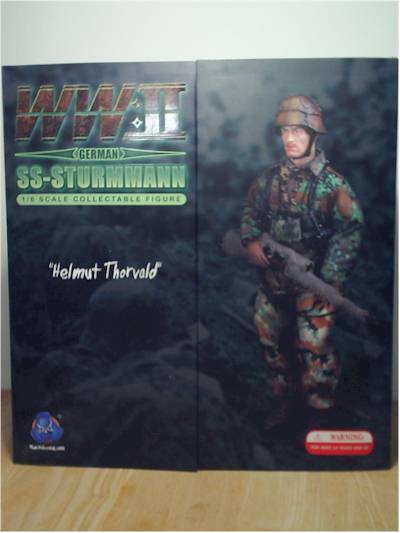 I would like to throw in a quick disclaimer in here… DiD makes historical military figures and Helmut Thorvald is German sniper. I was a little worried about this company at first because it seemed that all of their characters were of Axis powers, which is off-putting to say the least. But as the line has grown, more figures including US and Russian soldiers have been included. There product and website lack any disclaimer similar to what was presented with the Drastic Plastic figures, but I want to be clear that my review is in no way intended to reflect or endorse any ideological or political views. In fact one of the main reasons I selected this figure is that his design is very striking and disturbing. So without further ado, on with the review. Now, I’m not a huge fan of packaging and I am staunchly against MISB. But I can still appreciate nice package when I see it… hmm, that sounded weird… Anyway, I think that overall DiD’s packaging is well designed and is fairly collector friendly (some twisties here and there). I think my biggest gripe would be enormity of the box! It’s very wide and would take up a lot of storage space. On the plus side, the packaging has a number of images of the figure (which becomes helpful later) and the front of the box has two flaps that open outward to reveal the figure and accessories in all their glory… and let me tell there is a lot to see! The graphics on the box are nice, maybe a bit too modern for a WWII line, but they do seem to be consistent throughout the line which is a big plus for collectors. The head sculpt on this figure is amazing! It’s not a recognizable/famous face like you’d find with Ignite (at least not to me), but it’s sculpted with a lot of detail and comes across as very human. The sculpt reads very much like a real person, which doesn’t always happen in this scale. He also has a very stern and unpleasant expression that seems well suited to the character. In looking over some of DiD’s other figures this quality seems to be pretty consistent. The boots are sculpted as well and look very nice. The only other part of sculpting on the figure comes with the hands. The hands from DiD are the bendy variety but have a nice amount of sculpted detail. Like most 1/6 scale there is not a lot of paint on this guy, but what’s there is done very well. The main focus is on the head and it is a great combination of fine details and shading. This is definitely a situation in which the paint job really highlights the excellent sculpting. Besides the face there are paint details on the “trench section” display base, his boots and helmet as well as his grenades. All of these are very clean and nicely applied. The articulation on this figure is nothing short of excellent. According to DiD this is a Model ‘F’ body, which would indicate to me that they are another company that works to improve their product. Either way, in the shot I’ve provided you can see that the DiD base body is fairly similar to Dragon’s (even about the same height), but with some added points of articulation. The most notable improvements would be an increased range of motion in the shoulders, and extra mid-foot joint and ball-jointed wrists. Also these do have the aforementioned bendy hands, but these seem to have a better range of flexibility than most and can actually hold accessories! A small FYI: DiD bodies can be purchased fairly cheaply from kit-bashers and the one in the shot was later used in my Marmit Stormtrooper. So I know by this point your probably saying “another 4-star category, c’mon now!” I swear, I’m trying to be objective here, but this figure is literally loaded down with accessories. To start with, Helmut being a sniper logically comes with his rifle; and man is it cool. This thing is a combination of metal and wood, when I opened the packaging holding the rifle it actually smelled like a pine air-freshener. The detail on the weapon is amazing, the scope has glass ends and the weapon is wrapped in fabric (for cammo I assume) and comes with a strap. 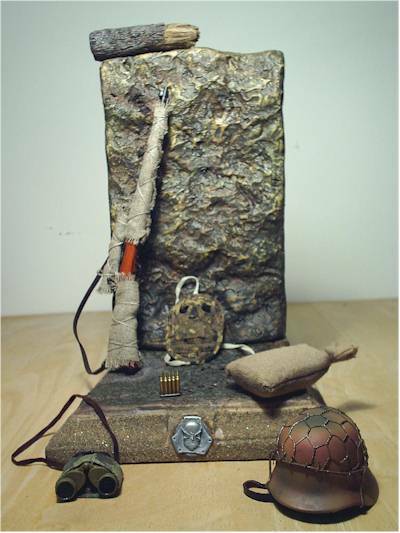 He‘s also got binoculars with a covering and strap, four die-cast grenades, 10 5-bullet clips (one set is die-cast), 3 spent shell casings, a “trench section” display base w/logo, a log and a sand bag w/sand in it!!! Wheh! I would say the only real problem here is that there could potentially be too many accessories. I’ll probably toss the box, which means I’ll have to find baggies to keep all this stuff straight. If you thought there were a lot of accessories, the outfit on this guy has even more stuff! This thing is a combination of great large pieces and a ton of smaller high-quality ones. I’ll begin with the Jacket; it is very well tailored and thick like you would expect a jacket to be, but it doesn’t really hinder the articulation. On top of that it is reversible! That’s right, reversible, and it actually looks good either way. Also he does have an undershirt, pants and boots. Now the pants are kind of a strange color, but I guess that’s historical accuracy for ya’. Nonetheless they are very well tailored and look great. The boots are molded plastic and look very realistic; although a little disappointing since the newer DiD figures have leather boots with working laces! To accent the jacket Helmut also comes with leather duty belt thingamajig (looks like a harness) that fits over his jacket which you can attach pouches and grenades to. He also comes with an assortment of patches that you can affix to his inner-shirt (as well as 1/1 patch you could wear yourself). To top this all off (pun intended) Helmut comes with a “steel” helmet with wire detailing (actual wire mind you, not sculpted) with a separate leather liner and a bundle of straw to use for extra cammo! 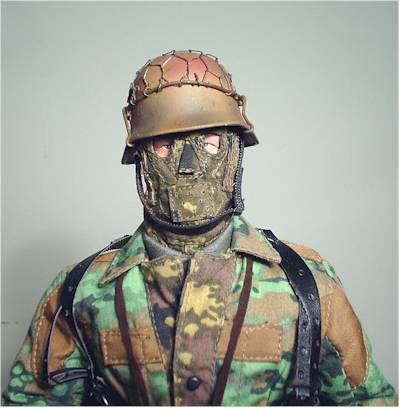 Oh, and I almost forgot the final piece of the outfit, which was actually the reason I bought this figure… the camouflage/Hannibal Lecter facemask. I guess this thing was intended to make his face blend in, but on top of that it just looks creepy-as-hell and really adds a lot to the figure. With the outfit, there are only only 2 nits I could pick here: 1) the helmet is pretty heavy and it can make balancing Helmut a little tricky and 2) there are no instructions included so you will need to use the box photos to put together the harness thingamajig. 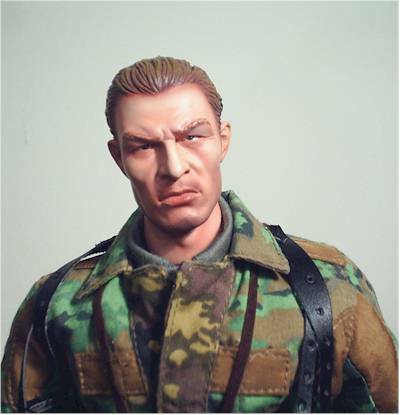 What can I say, I like the figure… but I’m not about to buy a figure of a Nazi for a kid. I think past the subject matter this is an amazing figure with great accessories and a very sturdy base body. 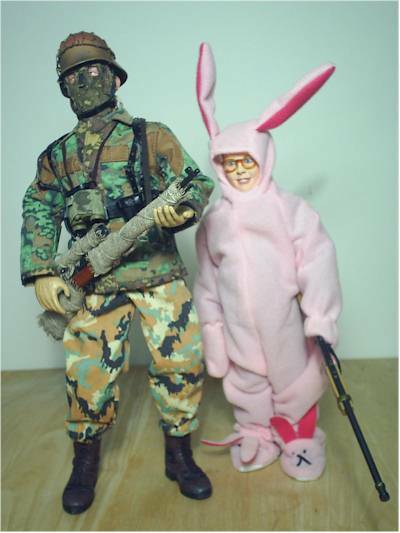 Some of the other soldiers could be more kid-friendly, especially of US soldiers, but maybe this is just my bias. I don’t think these were intended as play things so it won’t really affect the overall score for me. Finally, a lower score, see it’s not all wine and roses. I paid about $50 for this figure, and that seems to be about the going rate on eBay and online stores. I think for that price you are definitely getting a good deal for your money… but I would still prefer if the figure was a bit cheaper. I think for other figures of comparable quality this figure and other DiD’s are priced very well, but if you could get him for around $40 I think you’d be closer to a 4-star value. There are a number of small and difficult to manipulate parts on the outfit and accessories. I would recommend a pair of tweezers and some valium as you put this guy together. Be patient, use the box and make sure you don’t loose anything! No surprise here based on the score break-down; this is one solid figure. I think the packaging could be a bit smaller and it would be nice if the figure was free… but barring that I don’t think this figure could really be improved upon (except adding instructions). DiD is a company that doesn’t seem to get a lot of attention, but they are making some quality pieces. I’m not a military collector (despite the massive tank in the photo) but I am very impressed with my first figure from them and will probably pick up a few more. 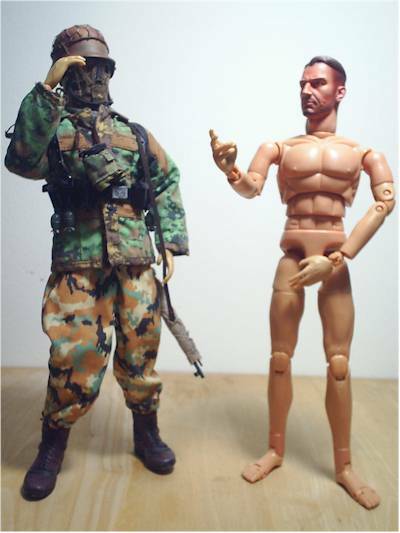 If you are into 1/6 military figures and like the stuff from by Dragon, BBI and Hot Toys these are a no-brainer. I got mine off of eBay, and there are a number of sellers offering these figures for BIN’s of around $50-$60. 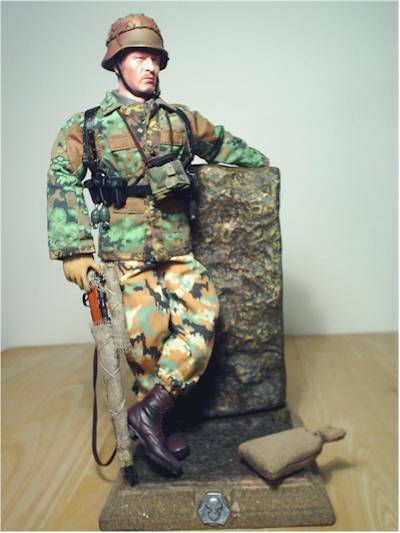 I would also check brick-and-mortar and online stores that carry military figures. Cotswold Collectibles – This is the only US dealer listed on DiD’s website, I’ve never dealt with them, but they seem to have good prices. 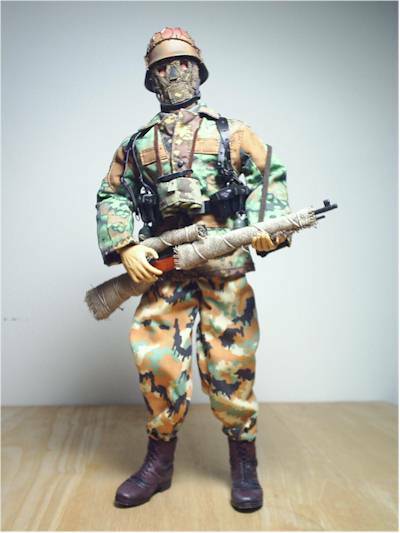 DiD online - If you are interested in this figure or others (they also have a Napoleonic, some extreme sports and military accessory lines) I would suggest checking out their website. It has a lot of information about the figures, their accessories as well as a ton of photos. Michael also has a guest review of their Lord of the Rings sixth scale figures available. Figure from the collection of galactiboy.